Top theme developers from all over the world use their skills and experience to craft gorgeous advertising agency WordPress themes. But while first impressions matter, it’s important to look beyond the design of your theme. Ads and marketing businesses need not just to attract traffic, but capture leads. This calls for a fine blend of content and functionality. Calls to action, social media buttons, and contact forms must all be placed effectively. Without enough customization options, you may not be able to place these where they are most visible. WP themes for advertising come with built-in drag-and-drop page builders. These enable you to rearrange theme elements like content, calls to action, or buttons in any way you want. At the same time, these themes are SEO-friendly and optimized for mobile devices. This helps with local SEO and creates a better mobile browsing experience. For most advertising and marketing businesses, clean designs work best. The design shouldn’t get in the way of the content. That means a navigational menu that’s impossible to miss, a sound site structure, and fast loading times. The homepage in particular should load quickly and set the tone for the rest of the site. Advertising WordPress themes share some similarities with real estate WordPress themes. They are accessible, streamlined, and to the point. Here are some of the best WordPress themes for advertising and marketing agencies big and small. With its polished design and smooth navigation, Swanxy WordPress Theme can be an inspired choice for your advertising or marketing business. A fast five-minute installation takes the hassle out of setting up your theme. A wealth of layout options, content modules, and Cherry plug-ins make this theme a pleasure to customize. And since it includes a live customizer, you can view changes in real time. Swanxy WordPress Theme is fully responsive — it looks great and retains all its features on mobile. This theme also comes with support for an online store, which you can add to your site in just a few minutes. Clean coding and 24/7 friendly support add to the appeal of this theme, which won’t become outdated anytime soon. Give your marketing site the professional look it needs. 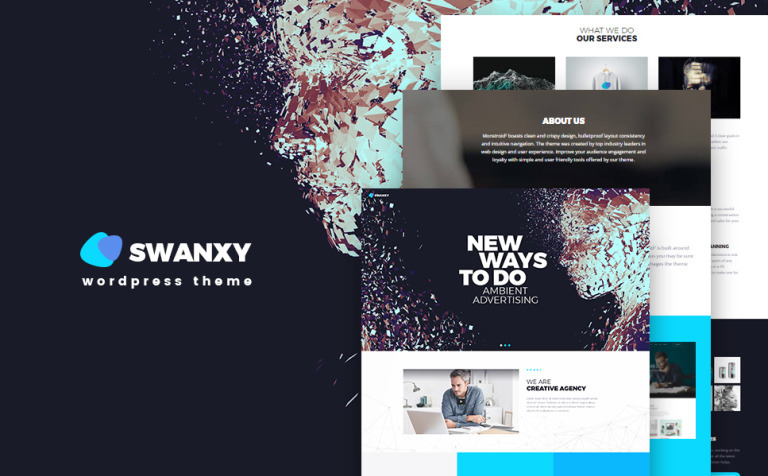 Try Swanxy WordPress Theme now. Build a beautiful and engaging website that attracts your audience. This advertising WordPress theme brings you a clean, minimalist design that’s perfect for that. The powerful drag-and-drop page builder helps you create beautiful pages fast. Content modules enable you to add images, contact forms, buttons, or calls to action anywhere in the theme — no coding needed. Choose from seven different header layouts and multiple layout options to give your site the look and feel that reflects your brand. Social media integration through custom widgets further enhances the appeal of this theme. You’ll also like the Slider and post carousel, both of which help you present content in an eye-catching way. 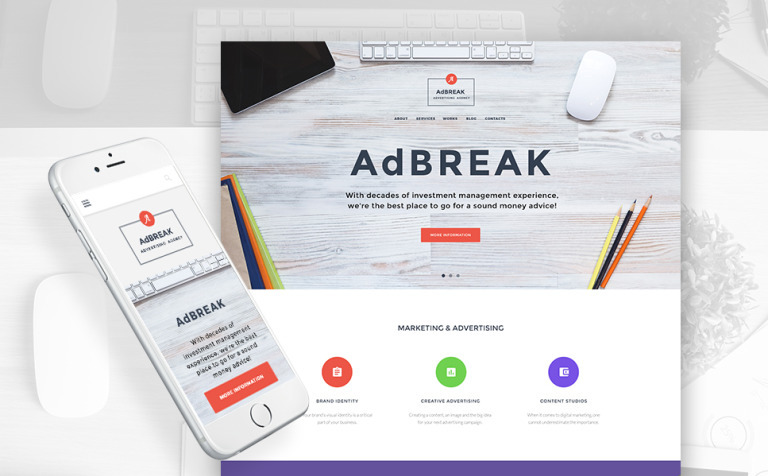 AdBreak – Advertising Company WordPress Theme is ideal for small and medium-sized companies who want to build a site themselves, without a graphic designer. Make your advertising site stand out. Try this theme today. Built on the versatile Cherry Framework 4, Adv WordPress Theme makes a great first impression with its immersive galleries and fetching buttons. The straightforward flat design gives you the freedom to customize this theme to your heart’s content. You’ll like the convenience of the MotoPress Editor, which lets you rearrange page elements visually. Drag and drop headers, content areas, and buttons help you create the right website experience for your audience. And since this theme is fully responsive, you don’t have to worry about optimizing it for smartphones or tablets. Parallax effects create a beautiful illusion of depth that gives your homepage and other pages a smooth feel. Another nice touch is the big menu, which streamlines the navigation even for sites with many different content categories. Adv WordPress Theme can keep visitors on your site longer and increase engagement rates. Try the demo now to discover all its features. 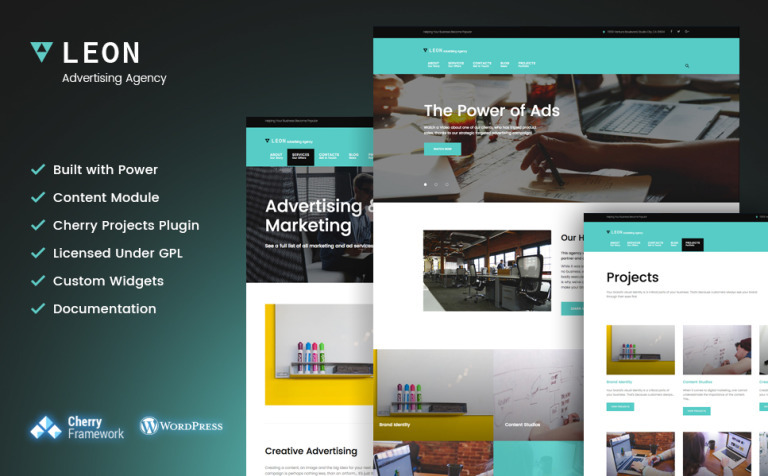 Streamlined and appealing, Leon – advertising, marketing and SEO agency WordPress Theme strikes a fine balance between design and functionality. The clean and well-ordered homepage sets the stage for the other pages, which are easy to reach through the menu above the header. This theme looks good out of the box, but you can use the drag-and-drop page builder and over 25 custom modules to change just about any aspect of it. PSD files are included, so you can play around with the graphic design elements as well. Leon is both mobile-friendly and SEO-friendly, which makes it a great choice for advertising agencies that target a local audience. One of the highlights of this theme is the projects gallery, which enables you to showcase your past clients in a visually engaging way. Saying this is one of the best WordPress themes for advertising isn’t an overstatement. Try it out now and you’ll understand why. Fast and engaging, this well-crafted WordPress ads theme can help you present your business in a compelling way. The minimalist design principles that shaped this theme are obvious right away. Empty space surrounds images and content areas, encouraging visitors to discover more of your site. Social media buttons are seamlessly integrated into the theme, connecting your site to your social pages. The drag-and-drop page customizer allows you to take control of every page element. Even if you haven’t built a website before, customizing this theme is remarkably easy. Content modules help you present all types of content in the most engaging way possible. Everything about this theme feels polished — nothing has been left to chance, and that shows in its overall quality. Whether you’re just starting an ad agency or want to redesign an existing website, this theme won’t disappoint you. Demo it now to get a better feel for what it has to offer. Elbrus is a versatile theme that can be extensively customized. Build a simple site with only a minimum of features or a highly sophisticated site loaded with custom widgets — this theme makes it all easy. Revolution Slider integration allows you to create sophisticated headers with beautiful effects. The Visual Composer helps you move page elements around and arrange them any way you want. Mobile optimization is also top-notch for this theme, which runs smoothly on both smartphones and tablets, without any loss of content or functionality. Overall, this is an accessible theme that displays information in an easy-to-digest way. It can help your brand keep visitors on site longer. Create a website that truly reflects the vision of your brand. 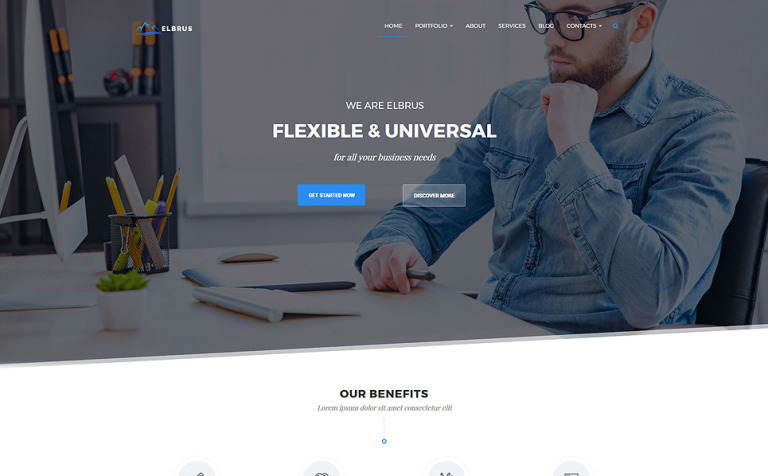 Try Elbrus – Business & Marketing Multipurpose WordPress Theme now! 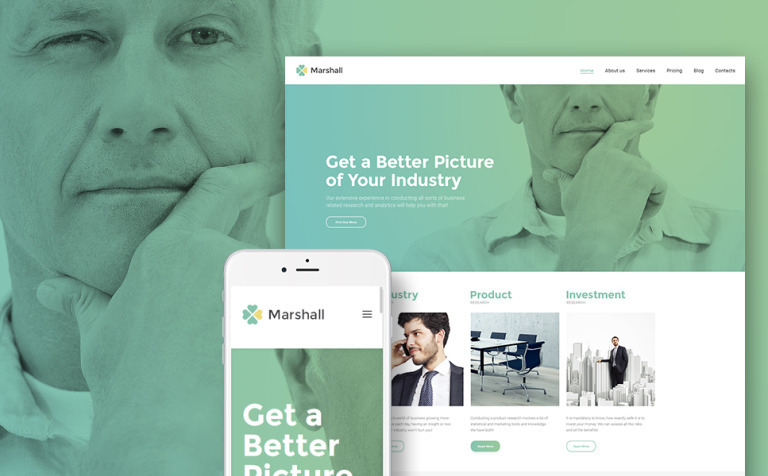 Ideal for advertising and marketing research firms, Marshal is a smooth theme that fits visual content perfectly into a minimalist design. This lightweight theme brings you a wealth of customization features, including a live drag-and-drop page builder that’s fast and easy to use. One of the key features of this theme is the custom widgets, which enable you to enhance your site’s functionality without any trouble. Implement all the social media buttons you need and display content in the most engaging way possible — with custom widgets it’s easy. Typography is another strong point of this theme, which lets you choose from over 500 Google Fonts. Marshal loads quickly on mobile devices, providing a fulfilling experience for smartphone and tablet users. If a good portion of your incoming traffic comes from mobile, this theme can help you make the most of that. Advertising agency WordPress themes don’t get better than Marshal. Try the demo now to experience this theme first hand. Laraway offers a professional design and all the functionality an advertising business needs to set up shop. With Cherry Team Members you can highlight your team in a visually engaging way. With Cherry Projects you can showcase your work. 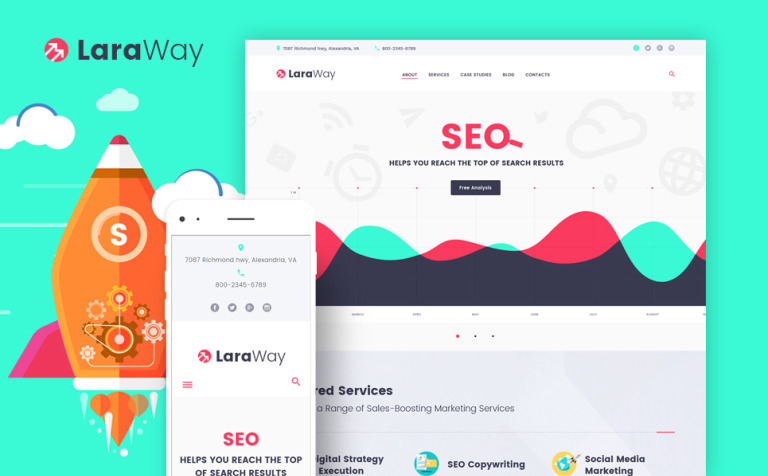 These features, together with the page builder, make Laraway an engaging theme for businesses that want a fully-responsive, SEO-friendly theme for their new site or redesign. This theme makes customization a breeze. Create custom sidebars, experiment with different layout options, and play around with content modules. Two other features you can expect from this theme are custom widgets and a live customizer. Give your site the look it needs to thrive. With this theme it’s easy. Discover why Laraway is an inspired choice for marketing and advertising agencies. Try the demo now. 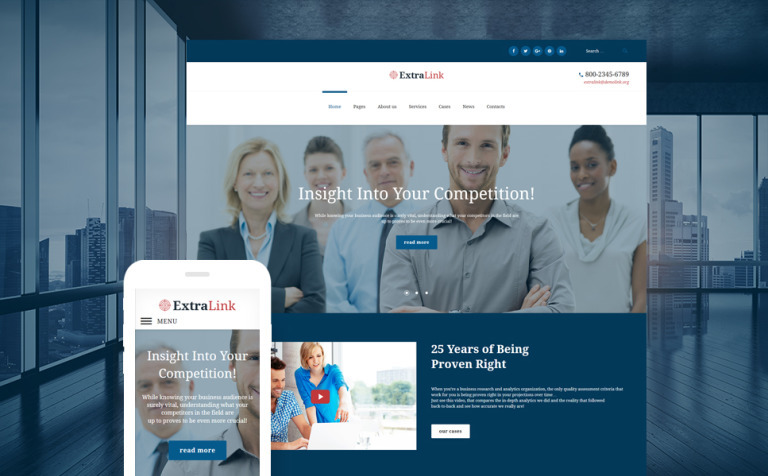 Elegant, customizable, and lightweight, ExtraLink easily adapts to the needs of advertising companies. Whether you’re creating ads or merely researching them, this theme can help you build a professional site that makes a great first impression on users. Customize your web pages to your heart’s content with the intuitive drag-and-drop page builder. Present content in the most engaging way with a wealth of easy to arrange content modules. Don’t like the default layout of the theme? You can choose from many different layouts. Last but not least, integrating social media buttons, event calendars, or audio content is easy thanks to custom widgets. Every design element that makes up ExtraLink seems crafted with care. The developers of this theme have left nothing to chance. Try this theme now and you may end up choosing it as your new website theme. 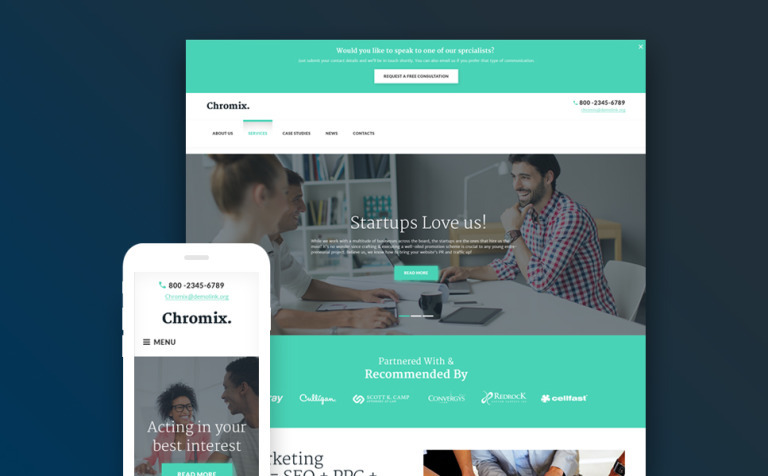 Chromix WordPress Theme is professional, yet inviting. From the first page to the last it stays professional, but it does this in a way that engages visitors. 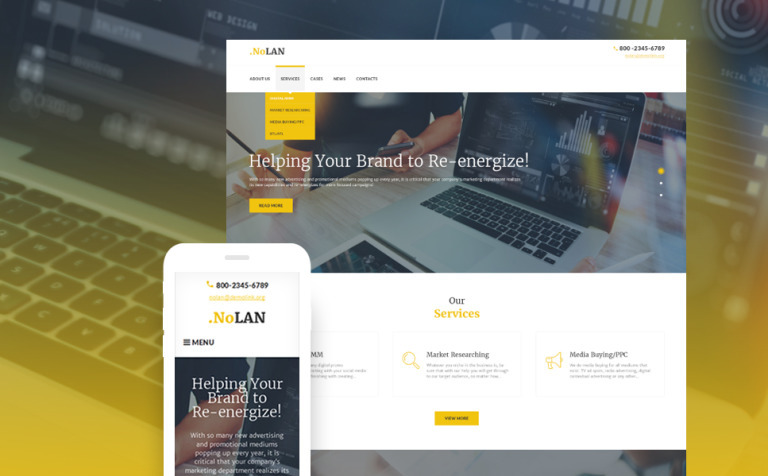 This SEO-friendly, mobile-responsive theme can help advertising businesses present themselves in the right light and make a great first impression. A powerful and intuitive page builder, multiple layout options, and content modules make this theme easy to customize. With Chromix you have full control over your pages and what gets displayed on them. You can strip them down to a minimum or add to them all the site functionality you need to get your message across. When you choose this theme, you get 24/7 support, so you can install and use your theme without any issues. You also get extensive documentation and the PSD files. Build a professional and polished site for your digital advertising business. With Chromix WordPress Theme you can do that quickly and in an enjoyable way. Try the live demo to get a better idea of what this theme can do. Before you choose a WordPress ads theme, make sure you try out as many different themes as possible. Subtle differences between one theme and another can make all the difference. The placement of the social media buttons, the way the content is presented, or the loading time of the homepage are all important. The great thing about the themes in this list is that they can be extensively customized. That’s crucial if you want to give your site a look and feel that truly reflects the image of your brand. Like the best WordPress themes in other categories, these templates won’t disappoint mobile users — fully responsive design ensures maximum mobile compatibility across platforms and devices. 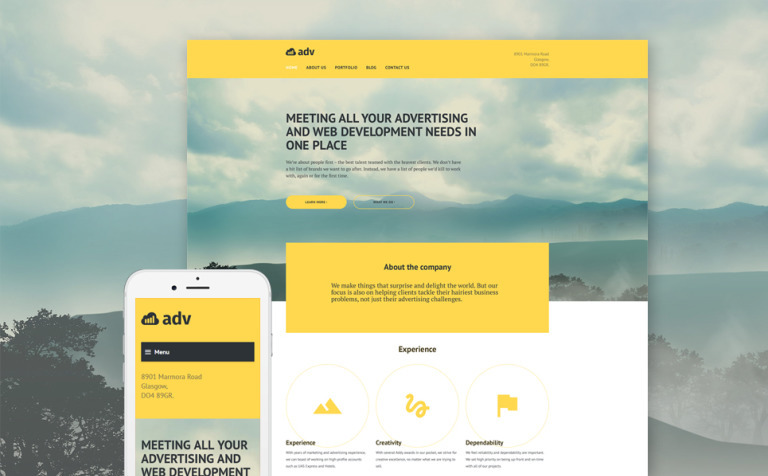 With these themes, your search for a WordPress theme for advertising agency has reached its end. Compare their features carefully and choose the one that suits your needs best. Also take into account scalability, as your business will likely grow in the years to come. Any of these themes is a reliable choice in the long term. What are the key features you look for in a website theme? And do you have a favorite WP theme on our list? Let us know in the comment section below.